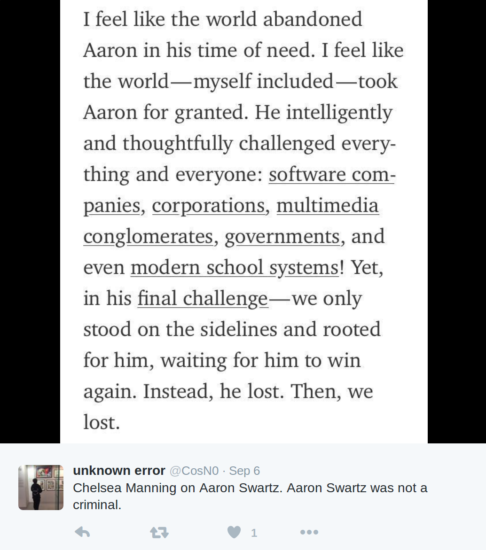 Aaron Swartz is a beloved icon of this generation and deservedly so. At the time the statement was made, weeping was entirely appropriate. 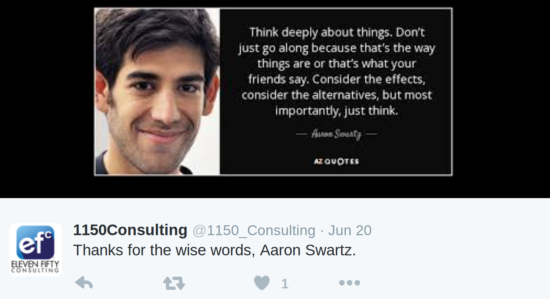 Swartz’s death was a huge shock that reverberated around the world. 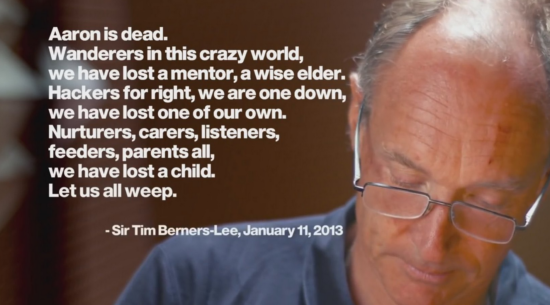 But nearly four years on, we need to stop weeping and start acting. Since Aaron’s passing, a series of memes has been in high circulation across the internet, sharing his words. Aaron’s messages resonate strongly. The general themes are freedom of information, the empowerment of and respect for the rights of the individual, along with calls for unity and action. Aaron was very clear about his sense of personal responsibility to act. Aaron was also wary of traditional forms of media and corporate journalism. He was a supporter of people having as much access to information as possible and from varied sources. There is a lot to learn from Aaron’s life but there is also a lot to learn from his death. People wax lyrical about how Aaron was their hero and I think it’s fabulous that someone as deserving as Aaron would be revered. What stays with me however, is that he didn’t get the support he needed before his passing. What scares me even more, is how many other Aarons are out there still alive, and not getting it either. We take them for granted and don’t feel the impact of their loss until they are gone. The warning signs were there for those who did their homework. 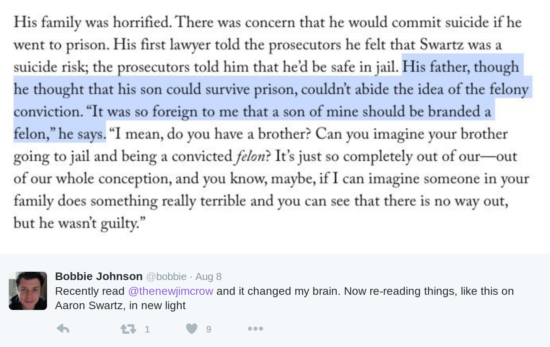 Just as the parents of Lauri Love have been warning the world, Swartz’s family also believed his persecution made him a suicide risk. We are all guilty of taking for granted not just the people who risk their lives to stand up for us, but also the precious few organisations who facilitate them doing so and attempt to meaningfully support those who do. The Courage Foundation is a classic example. Courage supports the seven most high-profile millennial whistleblowers in the world and would like to do more, but are limited by resource. Four months ago they announced a critical funding drive to back their core operations. They asked for 100,000 pounds. They got $8,000. How on earth are we ever going to save the lives of whistleblowers if the foremost organisation in the world acting to protect them can barely raise enough to pay for the basics of existence? What does all our love and admiration for Aaron mean if we sit back and watch the next Aaron die, and the next? 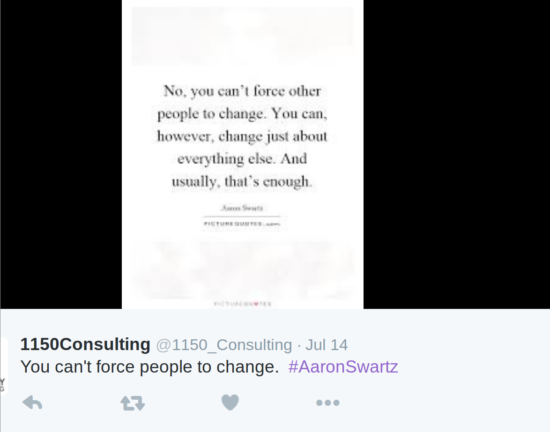 Aaron was of course, an empath and just as he says above, you can’t force people to change. But you can create systems for change. And that is what we must do. Systems that support whistleblowers and systems that support the organisations that support whistleblowers. We must act on their behalf just as they act on ours. And another whistleblower on death’s doorstep, twice now, and despite a ton of media coverage, legions of supporters and fans, mega thousands of retweets of her content and substantial fundraising efforts, there is still not enough meaningful action on her behalf: Chelsea Manning. We are falling short over and over again in our obligation to support truth-tellers. But this is unsurprising where we look at where our attention has been. On the grand spectacle of the U.S. election – the single largest mass-distraction exercise in existence. Yes, even us, the activists and journalists at the forefront of the new media revolution are guilty of participating in the circus, at the expense of greater things. There are well established ways to emancipate the caged. The pressure has to come from media generated by the public taking action on the ground. If we really, really want Chelsea out of prison? Stage an occupation outside the facility and refuse to move. 5,000 people camped outside the prison would do a lot more than 50,000 people signing a petition. And it is the responsibility of those figures in our movements who have the most sizeable platforms to lead the call. Instead of just endless updates about what stupid thing this or that or the other pundit is saying, or updates on whatever laws are or aren’t being passed that the intelligence agencies all ignore anyway, start campaigning for others and don’t stop. You know you’re good at it when you set your mind to it. Do it. Implore people to take action. Give them a framework to do it in. Then use your platforms to consistently build the momentum. Don’t give up until the objective is achieved. Be unrelenting. Save our lives and back the organisations that are trying to. Because there are too few of us to squander. I am nowhere near the top of the list of people who need help. I am not detained and I am not being tortured and I am not suicidal. Don’t wait til I’m dead to make a meme out of me. 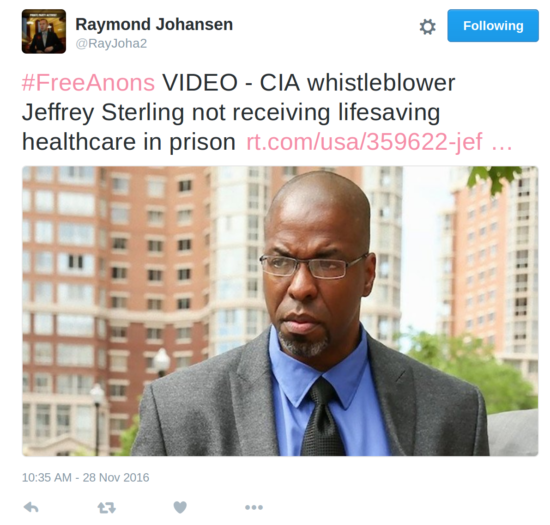 This entry was posted on November 29, 2016 and tagged Aaron Swartz, Chelsea Manning, whistleblowers. Bookmark the permalink.